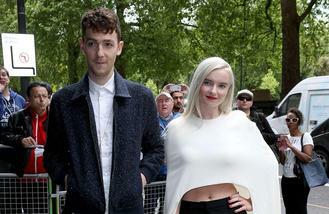 The 'Rockabye' hitmakers once considered going their separate ways, but Luke Patterson insists it wasn't as a result of bandmates Grace Chatto and his brother Jack Patterson ending their romantic relationship, although their split did make life in the band awkward for a while. Luke recalled to Q magazine: "It was a bit weird. With Jack and Grace, I always had to pick and choose when to stay out of the way and when to try and help, but that time [when they split] I totally stayed out of the way. It was turbulent." Asked if they had considered splitting, he added: "No, not in relation to that...[Why?] Just other problems." In order to curb the difficulties of being so close after ending their romance, Jack opted out of a tour with the band, which had some positives. Grace said: "When Jack and I broke up, we decided that Jack would stay at home and start writing the second album, rather than tour with us. "The happy side of that is that Jack wrote loads of amazing stuff." Last August, the 'Rather Be' hitmakers saw the departure of violinist Neil Amin-Smith, who quit by email. But the remainder of the band weren't too surprised as they knew it hadn't been Neil's long-term goal to stay in the group. "We've always been quite committed to making it a big project. [Wasn't Neil?] Well, he was when he was." Luke added: "He'd had enough." And the trio haven't seen much of Neil since he left, apart from a few unplanned meetings. Of his encounter with the musician, Luke laughed: "I was half-naked to be honest. The wrong half too. "We were in the changing room at the gym."